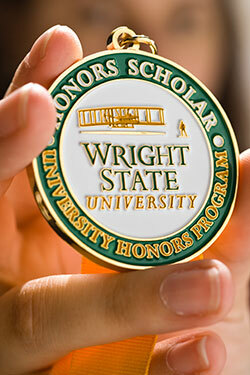 Wright State University moved to a semester calendar beginning Fall 2012. The requirements outlined below relate to the semester calendar. For more information on the University Honors Program's quarter-to-semester requirements for continuing students, please review the Honors Semester Transition web page or the approved Honors Semester Plan (PDF). Complete a total of seven (7) Honors courses with a grade of A or B. Two of the seven must count for the Wright State Core, one must be a UH 2010 or 2020, and one must be a UH4000 seminar. Have a cumulative grade point average of 3.5 or higher at the time of graduation.